Boston Globe: America on Edge - In Pennsylvania, baby boomers see the American Dream slipping away | The American German Business Club Berlin e.V. First in an occasional series examining the unsettled American electorate. BUTLER, Pa. — Some 965 high school graduates paraded into the high school stadium, surrounded by lush green trees and proud parents and the trill of an organ playing a celebratory theme. For the class of 1976, the future was as bright as their golden gowns. One speaker told them they had “almost unlimited opportunities.” Sure, it’s a cliche uttered at countless graduation speeches. But in a country celebrating its bicentennial, and in a town that seemed still in its heyday, it certainly felt that way. The proof was close by as the new graduates sat in the bleachers watching the sun set that Friday night: two heavy-manufacturing plants, Pullman-Standard and Armco Steel, that provided not just a steady paycheck to thousands but provided the town with an identity. Now many in that class are turning 58 years old, and Butler is a shell of what it was four decades ago, with the mills long-since shuttered or shrunk — casualties of the globalized steel industry — taking most of the jobs and that old sense of security with them. People here are approaching their golden years with a sense of bitterness about the new, unforgiving economy and foreboding about what they will have to show for this life. Something their parents could count on — a comfortable retirement, debt-free and maybe in a warmer place — seems out of the question to many who say they see themselves scratching out a living until they are buried in the cemetery on the hillside near Connoquenessing Creek. As interviews with more than a dozen in the Butler High School class of 1976 show, many of those bright-eyed 18-year-olds now feel weary, worn, baffled, furious. They were raised to work hard without complaining. But such stoicism is hard when the old dream they were sure was theirs is slipping away and with it any confidence that the country and its leaders understand their plight or care enough to try to help. There is frustration, too, and plentiful disgust, at the state of the government and of politics more broadly — an outlook that leads some but not all toward Donald Trump, a candidate they feel is speaking for them like no one before. Or at least not speaking like the politicians they have come to resent. Barnett thinks the government spends too much, and the debt has grown too high. Health care costs too much, and gobbles up money that could be saved for retirement. Sure, he says, Trump sometimes says embarrassing things. He may be a risky choice. But he’s better than the alternative. “At this point in my life, and the way the country is, I’d be more inclined to give somebody I don’t know a chance than somebody who has proven to be part of a machine that I don’t like and don’t agree with,” he said. 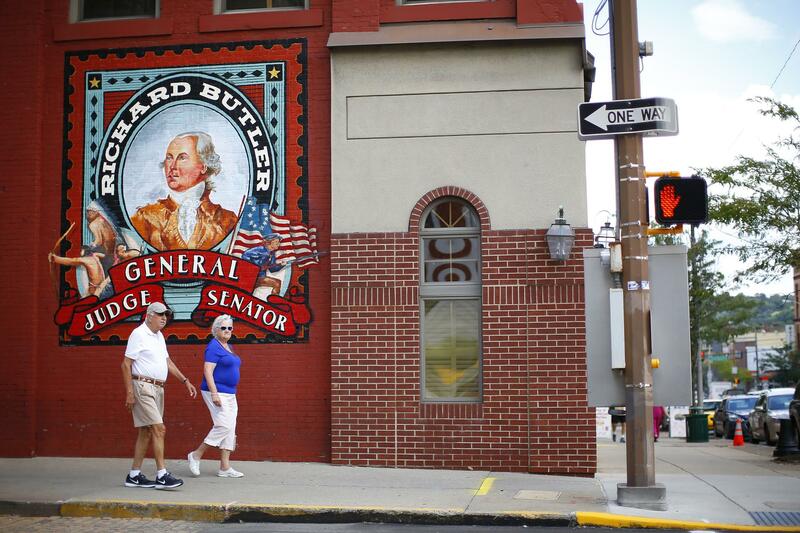 A couple walked past a newly commissioned mural in downtown Butler. When Pullman-Standard Co. began production on the western part of town in 1902, some 2,500 workers were turning out 60 steel-bed railroad cars every day. Immigrants from Eastern Europe moved in to the area in the early 20th century, drawn by the prospect of reliable work and living, at times, rent-free in company-owned homes. Pullman built a local ballpark where for about a decade the New York Yankees had a farm team. The likes of Lou Gehrig and Joe DiMaggio once played there. During World War II, the Pullman plant produced artillery and naval shells. The jeep used by the Army was said to have been designed and first built by the Bantam Car Co. in Butler. Armco Steel could also be relied on, as an employer and a civic force. It hosted annual Christmas parties for families, where children were given six candy bars while watching a double feature. College scholarships were offered to children of employees. During summer months, the town had “neighborhood nights,” where everyone would descend on a different neighborhood for a night. 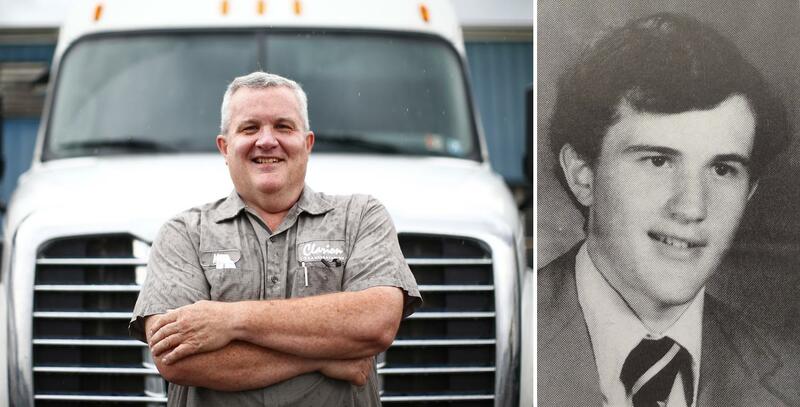 When the class of 1976 was growing up in Butler, it was a bustling manufacturing town with optimism, you could say, its leading product. And as they entered their senior year, there was little cause for strife. Well, there was one: Students staged a walkout in part because the administration removed the jukebox at the school. The jobs in town could be tough, but they were reliable. They provided health care and healthy pensions to their employees. In the years after the 1976 graduation, parents of those students began to retire, often by age 55. Some bought a second home in Florida; others moved there for good. For the class of 1976, those opportunities were still there, as captured by the front page of the Butler Eagle during the week of graduation. Next to a photo of five bearded men who won a contest for their scruff at a local carnival was the banner headline: Unemployment Shows Dip. Those sitting under the clear sky that night would go on to serve in the military, go off to college, or — most coveted at the time — use family connections to get a job in one of two local manufacturing plants. But it wouldn’t last long. Some took jobs in the mills, but the firms soon started cutting back. Pullman-Standard closed altogether in the early 1980s, blaming a glut in the market for rail cars. The other day as Bob Emigh stood in his jewelry store — one that, after years downtown, is now in a strip mall between a Dunkin’ Donuts and a Little Caesars — he said he would probably never retire. He can’t imagine having enough money, and he doesn’t trust that the federal government will live up to its promise of paying Social Security. Anxiety over retirement is part of a nationwide phenomenon, but one that hits struggling middle-income areas like this one particularly hard. Nearly 7 in 10 of America’s middle-income baby boomers don’t believe or don’t know whether they have enough money to live comfortably to age 85, according to a recent survey by the Center for a Secure Retirement. Eight in 10 still have some debt, and nearly one-quarter have a mortgage with more than 20 years remaining on it. Munnell helps oversee a National Retirement Risk Index that measures the economic prospects of retirees. In 1989, about 30 percent of Americans were at risk of falling short of sustaining their standard of living. By 2013, that figure had risen to 52 percent. A range of factors is contributing to retirement anxiety. People are living longer and the cost of health care is rising, which triggers a need for a bigger nest egg. The legacy of the housing crisis is also taking a toll. Many in the past entered retirement having paid off their mortgage — reducing their expenses and providing a pot of ready equity. That is much more rarely the case today. Income expectations are also unsettled. A risk that used to be borne largely by big institutions — like the government or large employers offering pensions — is now put almost entirely on the employee. In 1983, for example, 62 percent of workers had an employer-sponsored pension and 12 percent had 401k plans. Now, only 17 percent have pensions and 71 percent have 401k plans. The end result is that more Americans are working longer. Last month, 18.6 percent of Americans age 65 and older were still working either full or part time, according to the Bureau of Labor Statistics. That was up markedly from the 10.8 percent who were working in 1985, and the percentage is expected to grow. Left: Mike Linnon drives a tractor-trailer today. Right: Linnon in 1976. It’s a rainy afternoon, and Mike Linnon, a graduate of the class of ’76, has just woken up in the back of his tractor-trailer. He has trouble figuring out what day it is. That’s what happens when you work 14-hour shifts, driving a truck around the East Coast to deliver fiberglass shower stalls. He’s bounced around from job to job. The one going door-to-door selling insurance didn’t go so well. The one building steel frame buildings was better. The work now is steady, even though he longs for more regular hours. He said he sees a tearing of the social fiber of the country, largely due to the disintegration of family. He’s not exactly pointing fingers — he himself is divorced (“I could have made my marriage work. Unfortunately, my wife didn’t feel the same way.”) — but it is a trend he fears. He concedes that Trump lacks specificity in his policy prescriptions. But that doesn’t matter to him. He grows emotional while talking about his father’s generation, the grit and determination they showed in fighting, both world wars and economic hardships. They came out stronger for it, in a way that he doesn’t see today. Back then, sacrifice was imbued with some larger meaning, of going to war to defend a country you understood and whose economy would honor that sacrifice by churning out jobs you could count on. Now, the meaning of sacrifice feels harder to discern. He tears up, and then apologizes for his emotion. Now that neighborhood is filled with houses that are boarded up. A mattress sits in front of one home, and toys and a red wagon are flipped over in another. A place that used to take pride in a strong community is now pocked with homes with “No trespassing” signs outside. A half-dozen grocery carts are tossed about in places nowhere near a grocery store. In downtown Butler, on a recent afternoon, most stores were already closed by 4 p.m. Why stay open for customers who aren’t coming? Others have closed for good. Worsley’s Furniture (Est. 1927) is out of business. Across the street Morgyn’s Frozen Yogurt and Treats (Est. 2014) is, too. The Penn Theater has a padlock on the door, and the “coming soon” poster is for “Aquamarine,” a movie that came out in 2006. “My mother used to tell us, ‘You have to do better than us,’ ” said Liz Archambault, who just turned 58. But sometimes it’s unclear whether they will. Archambault — who in her high school days used to do the morning announcements over the school intercom — and her husband recently sent two kids through college, helping with the hefty tuition bills. Their daughter is getting married next year, and they hope to provide her with a memorable wedding. Health care isn’t getting any cheaper. Her parents — a mother who worked nights as a registered nurse, and a father who worked for the state highway department — retired some 30 years ago and moved to Fort Myers, Fla. Her husband’s parents went to the Villages, a massive retirement community in central Florida. “They live the high life there,” she said, wistfully. Tennis. Golf. Dinners out. It’s not that they are down and out. They have a nice home, built on land about 5 miles from downtown that her parents used to own, and they have a boat. But her husband lost his job as a sales and marketing director for a health care company two years ago — then took another job for half the pay and, after nine months, lost that, too, and is back looking for work. She’s taken on two part-time jobs. She’s beginning to accept the fact that the retirement dream they used to have may never be. But the uncertain road ahead is not leading her to Trump. She and a few of her friends are planning to vote for Hillary Clinton — quietly. On Main Street in downtown Butler, Larry Goettler sits at a bar stool in his restaurant, The Brick House. The former four-sport athlete says that to survive he has had to be a generalist, not a specialist, and that’s clear from his restaurant. It has both white tablecloths and, in the back, a corn hole game. Off to the side is a pool hall. There’s a little something for everyone. He’s saved some money for himself, but he’s not feeling confident that the government is going to provide much. He still feels burned about the aftermath of the economic crisis. Banks and investment houses that were deemed “too big to fail” were saved, but impact of the recession on little businesses like his was an afterthought. He buys his own health insurance. Before Obama’s health care plan was implemented, he had gotten his premium down to $250 a month by accepting higher deductibles and out-of-pocket costs. After the law, Blue Cross Blue Shield canceled that plan and he had to buy another. It offered almost identical coverage, he said, at twice the price. Some of his buddies have company jobs, with pensions or matching 401ks. They plan to retire in three years. It’s a sore spot. The ethos of Butler, like so much of the Rust Belt, is to keep working, and not to complain — or not too loudly. But as Goettler and his classmates reflect on the past four decades, there’s the unmistakable feeling that things have changed. For good and not for the better. He hopes one day to slow down, maybe to 25 hours a week. Cindy Lasher Hindman has no retirement fund. She has a credit card, but every time she uses it, she makes a point to also stuff some cash inside an envelope at her house. That way when the bill comes she knows she’ll be able to pay it. While in high school, Hindman worked for a local gas company. She had been there for 10 years when she wanted to move to part time to take care of her young children. When they said no, she quit. For nearly 30 years, she worked part time at a small accounting office. Since the office closed, she’s been doing bookkeeping for the owner of a local Mexican restaurant. She and her husband, a truck driver, make enough to pay the bills. But not enough to stash away much for the future. She is angry about the economy, and thinks Washington is a mess. She’s torn by what she views as two inadequate options in this presidential election. A few weeks ago, the Butler High School class of 1976 got together at the local American Legion post for their 40th reunion. The cost was $19.76 for dinner and dancing. They wore stickers with their yearbook photos on them. They paid homage to the nearly 70 of their classmates who had died. They danced for more than three hours on a linoleum floor, at one point forming a conga line with the lights dimmed. It was a happy night. It reminded them of a time now past, when the future seemed boundless, when Butler was great.